On the final day of the ongoing RSS Akhil Bharatiya Karyakari Mandal (ABKM) meeting going on in Annojiguda, Hyderabad, Sarkaryavaha Ma. Sri Bhaiyyaji Joshi interacted with the media. 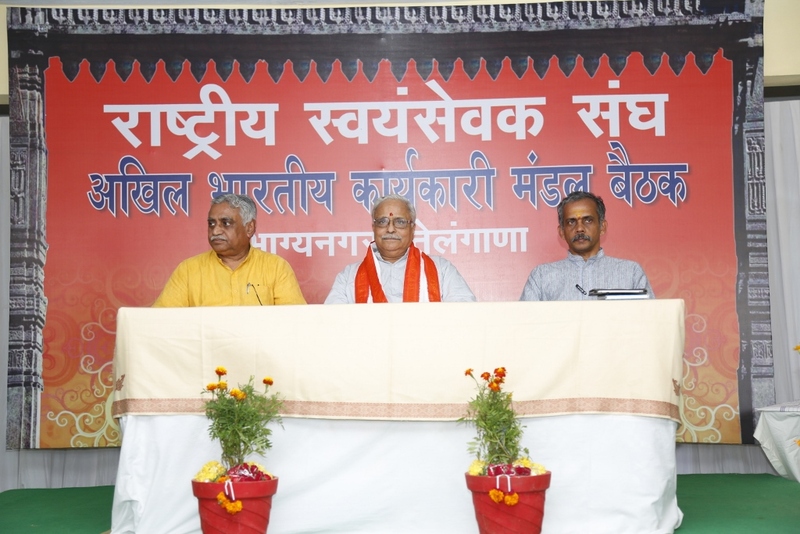 Bhaiyyaji Joshi expressed concern and condemned the recent spate of brutal communal violence by radical jihadi elements and the inaction of the ruling establishment in states like West Bengal, Tamilnadu, and Karnataka. The attack is not limited on Hindutva activists but Hindu society at large is also targeted by Jihadi elements. He urged the concerned state governments to punish the culprits. Sangh now has presence in 44,000 villages across the nation and have 70,000 working units. It expects the numbers to surge to 75,000 by March 2017. He called up on society to end caste based discrimination and make society more safer for women and create an environment in which women feel empowered to create their own destiny. He also urged society at large to respond to Prime Minister’s call for Swachh Bharath and make our nation clean and healthy. It’s an issue close to heart of Hindu society and has been in Sangh’s focus for over 30 years. After the Allahabad High Court judgment, it is clear that Ram Mandir should be built there. However, we are waiting for Supreme Court to deliver its verdict. The issue of Triple Talaq is an internal problem of the Muslim community. Discrimination based on gender is not right. It’s a challenge before the society to safeguard interest of women and society should review it closely. The judiciary should take a humane approach while deliberating on this issue. Answering the question on Uniform Civil code, he remarked that law must be upheld without discrimination and without at disturbing cultural traditions and social fabric. Bhaiyyaji remarked that not only Chinese, we must find an alternate to all forms of imported goods. Except for the ones that have no alternate, we must encourage and use Bharatiya products. Bhaiyyaji mentioned that Sarsangchalakji had elaborately explained RSS view of Gau Seva and Gauraksha. Gauraksha should not only be viewed from a religious angle, but we must also take into consideration that the desi-gau ( desi-cow ) forms the backbone of Bharat’s rural economy. Deterioration of soil due to excessive use pesticides can be addressed only by cow-based farming. The constitution begins by stating “We the People of India”. The distinction between “minority-majority” does not find place in our constitution. By twisting the meaning, we have ended up in minority-majority politics. Whether Pakistani Artists Should be allowed ? Art is universal and so is an artist’s domain. However, when the artist refuses to respect our country, why should he or she be allowed. Social Justice &Manu Dharma Shastra : Answering the question whether RSS has newly embarked on issues of social justice and if they have left Manu Dharma Shastra, he replied that RSS has always said that it does not believe in birth based jaati ( caste ) and jaati-based discrimination. Sai Baba : Hindus perceive manifestation of divinity in the entire nature and so naturally believes that there is divinity in each human being. If followers of Sai Baba want to build a temple, it is their choice. For national security, the Government took a strong decision and the Army bravely executed it. For that we congratulate both the army and the government for their decisive strikes to ensure that the country’s security ensured. The nation will be celebrating Deepavali shortly. Deepavali’s message is to bring in light to end darkness. I wish you and all a very Happy Deepavali and pray that the nation moves into a bright future.